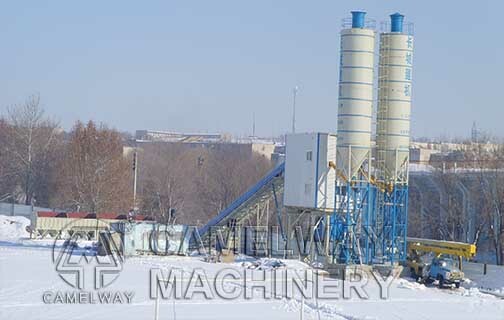 HZS90 concrete mixing plant is the Zhengzhou CamelWay machinery for the majority of road and bridge construction needs of professional design and manufacture of special equipment. 4, Cement weighing range and accuracy (0 ~ 900) ± 1% kg, admixture weighing range and accuracy (0 ~ 50) ± 1% kg, aggregate weighing range and accuracy of 0 ~ 5000 ± 2% . 5, HZS90 concrete mixing station cement: cement warehouse for construction, urban construction, road and bridge water conservancy and construction of bulk cement and other bulk materials such as bulk reserves, can also be used for mixing stations scattered cement reserve equipment . It can replace the civil bunker, with water, moisture, to prevent the loss of cement and environmental pollution. Than the small area of the building material hopper, for long life, low cost. HZS90 station aggregate conveying method is generally conveyor belt; HZS90 mixing station cement and admixture of the conveyor for the screw conveyor and pneumatic conveying; whether aggregate or powder transport, we are in the design and production are As far as possible to consider the reduction of dust generation. Ensure that the equipment meets environmental requirements. This entry was posted in Solution, Tanzania Batching Plant and tagged concrete mixing station by camelway. Bookmark the permalink.